My first morning at Scotch on the Rocks was a bit rough. Despite getting to bed at a decent time (10:30 or so) so I could catch up on my sleep, I ended up waking up around 3:30 or so in the morning and tossing and turning till 6. 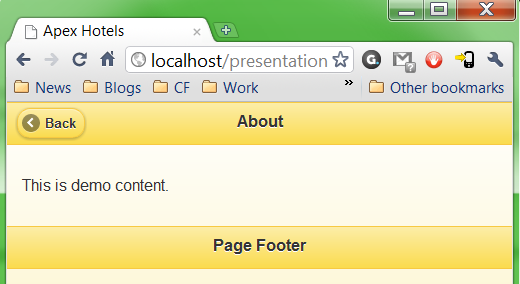 During that time an idea popped in my head for one more demo I could do for my jQuery Mobile presentation. 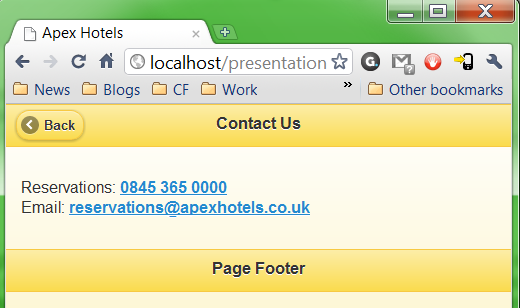 I was thinking about building a simple mobile web site for the hotel. I thought it would be a simple example but also pretty practical. Of course, once I figured out a simple, static plan for the site an idea occurred to me. One of the important details for a hotel - obviously - is where they are. But what if you could not only tell folks where the hotel was but how you could get there? Here’s my demo which shows just that. I’ll warn you now - it’s brittle as heck. It’s really just a proof of concept. But it works (mostly) and I think it’s pretty cool. Ready? First, I'll begin by showing a few screen shots of the application I built. This is online and I'll share that link at the end, but for now, let's just look at pretty pictures. My hotel mobile home page has three links: Contact Us, Find Us, and About. Contact Us has the basics - a phone number and an email address. Yeah, nothing important here. This is where you can stick the content the marketing department insists on that is most likely 100% useless to visitors. Let's face it -you know you will need to add it to the site. At least by making it the third link it isn't as distracting and doesn't interfere with the critical information. That code covers the home page and the About page. Here is the code behind the Contact Us page. Ok, now let's look at Find Us. This page does two things. 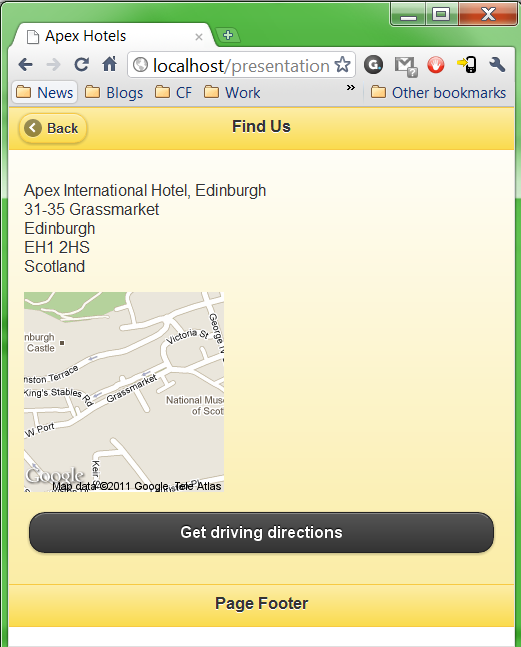 First, it shows a simple map to the hotel. For this, I used the address of the hotel hosting the conference. 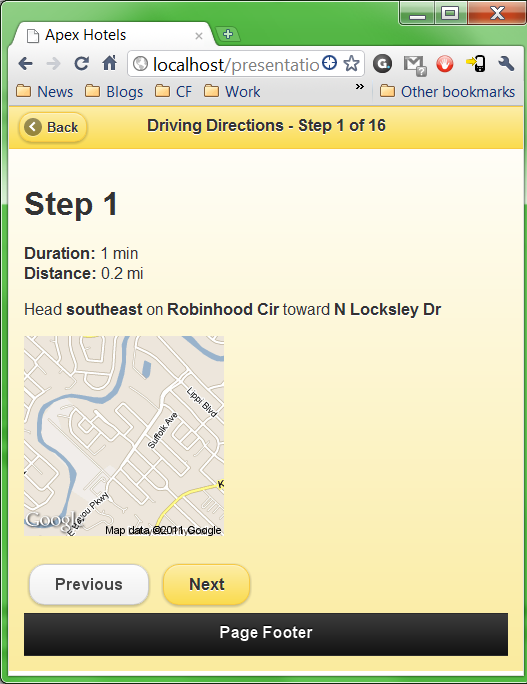 Secondly, it provides a link that will be used for driving directions. 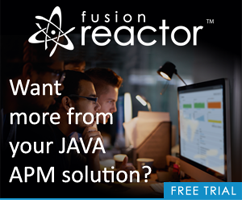 All store.cfm does is take the JSON, deserialize that, and store it into the session scope. And that's it! As I said, this code is brittle. 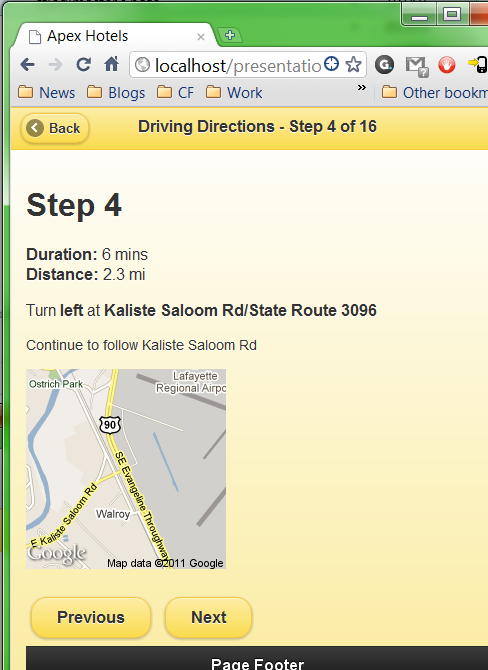 You will notice that if geolocation or driving directions fail we just use an Alert. There are much nicer things we could do. For example, we could ask the user where they are. 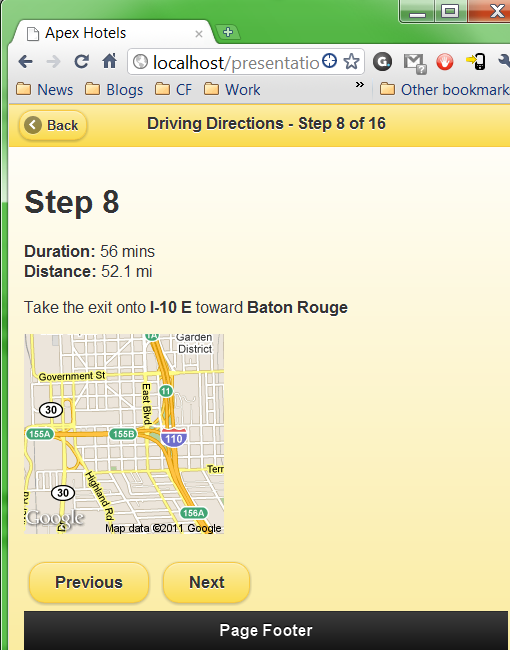 If driving directions fail we could do what most places do and assume you are coming in from the closest major highway. But - hopefully you can see how easy it is to add in complex services like Google's driving directions within a simple jQuery Mobile site. To try this demo, hit the button below. But please - do not stress out if it fails for you. As I said, it is brittle, was built fast, etc, and at least kind of works. I've included the full code for this demo as an attachment to this blog entry.